For clarity, did you do the Rev 1 front and rear oem stuts and Mountune black springs? Springs will usually take a 1000mi to break in and settle. The struts will also slightly break-in over the next 1000 mi. You might want to add a set of adjustable front end links to remove any load on the sway bar since the springs would have lowered the car. Do the same for the rear if you are on stock swaybars. This will also aid ride. I have the Rev. 2 now for the fronts - Rev 2: after 11-08-17 (G1FZ-18124-E/F). My rears were already the current revision. And yeah I figured it would take some time so going to give it a bit. As far as the endlinks, the drop from the Mountune springs is modest, not something like the Whiteline springs or going full coilovers or anything so the car isn't lowered enough (in my opinion) to warrant that. Still have stock swaybars too. On my car the drop was ~ 9/16" all around. The stock sway bar bushings have a unique design that allows the inner portion of the bushing to rotate a small amount before transferring the energy to the bar. This seemingly small factor can make a noticeable ride difference over irregular surfaces..... infact i had to change the length of my link by nearly 1/2". A simple set of adjustable links allows there centering of the link so that the bushings/sway bar aren't static loaded. While this sounds like a modest change, it was felt when on the hwy or on surface irregularities.....I think it also contributes to reducing bounce/pogo in in certain situations. If you've gone this far, I'd recommend adding the adj. front end links to your front bars and putting a WL rear (22mm set to stiff) swaybar wo/adjustable links in the rear. This combo really improved the ride as well as handling for a noticably improved streetable setup. Last edited by lflouie; 12-29-2018 at 04:36 PM. On my car the dropwas ~ 9/16" all around. The stock sway bar bushings have a unique design that allows the inner portion of the bushing to rotate a small amount before transferring the energy to the bar. This seemingly small factor can make a noticeable ride difference over irregular surfaces..... infact i had to change the length of my link by nearly 1/2". A simple set of adjustable links allows there centering of the link so that the bushibgs/sway bar aren't static loaded. While this sounds like a modest change, it was felt when on the hwy or on surface irregularities.....I think it also contributes to reducing bounce/pogo in in certain situations. If you gone this far, I'd recommend adding the adj. front end links to your front bars and putting a WL rear (22mm set to stiff) swaybar wo/adjustable links in the rear. This combo really improved the ride as well as handling for a noticably improved streetable setup. That's interesting feedback. I'll have to look into that. Does look too expensive, but if you could recommend me a set that's good I may go that route. Last couple of reviews I looked at for those some were "aftermarket" but hardly adjustable over stock which made them pointless. As far as the rear sway bar, wanted to get a track day in before doing so so I understood where I was at and what difference the bar makes. I wish anyone could answer this for us. I read of 1-2 2018 owners that said the pogo is still on the 2018 and still needs to be addressed. I’ve been trying to be patient on this since I got the car (almost 2 full years now) but my patience is wearing. Lichtfield seems the best solution to me. But I do not like that KW USA is all F U on working on them. That kind of chaps my A. They will need to be rebuilt at some point, yeah that will be tens of thousands of miles but still. Go with KW DDC then there is more of a drop and I don’t want any drop. Best solution is Tractive but they want your first born to buy their setup. It’s incredibly expensive and borderline ridiculous in price for this class of car. I’m not buying today but if I was I’d probably say F it all and buy from Ohlins. Yeah you lose the dual mode but I have never mounted Ohlins suspension on my sport bikes or my cars and been disappointed. I’ve got them on my bikes in the garage and when I’ve had them on my previous cars, their OEM settings are dialed in for a street car, twisties, and 7 to 9/10th’s on the track. Only needing to change compression or rebound to suit a particular track but you’ve got to be really hitting your lap times for that to be necessary. For a street car and twisties I don’t touch their settings. And Ohlins are easily rebuildable here in the USA. You get excellent service also. I’m no fanboy of any brand of car or motorcycle but I am an Ohlins fanboy. Those gold beauties are works of art, best in industry to me (yeah I haven’t tried Tractive), and my deal gets hard opening up the Ohlins box and seeing that new gold shock, forks, or dampers. I love the damn things and they just work so damn good on anything I’ve ever mounted them too. They are my favorite mods on my sport bikes in the garage. Great feel, soak up road irregularities and I bet my life on them every time I ride. They always deliver. I may say f this dual damper mode and just go with the gold yet again. Hate to lose dual mode but track mode on the suspension will be used so little I don’t know how relevant it is. I trust Ohlins all day over KW. If Ohlins just would have made theirs dual mode I wouldn’t even consider another brand. Do you have any consideration for the MCS Single Adjustable setup? With springs, it's about $3100 but, as far as I know, these coilovers allow tremendous height adjustment even letting you raise the car a bit. WL makes a set of front adjustable links that work fine. I think you can get them from CJPONY...roughly $150. Understand your interest in choosing the right bars and desire to balance the car. I've personally tried most of the rear bars, and found them too stiff. However if you are going to be tracking quite a bit and running stickier tires then going slightly stiffer could work. In my opinion, if I was going to track my car I'd go with the WL front and rear bars, or the Super Pro....which are very similar in size but have different adjustments (holes) front and rear.......I think Super Pro would be my first choice bc of more rear settings and finer adjustment. Last edited by lflouie; 12-29-2018 at 04:41 PM. I went ahead and pulled the trigger on the revised struts and shocks few weeks ago. Got a pretty decent price on everything from RockAuto. I was a little confused by the various part numbers, but I believe the relationship between the part numbers below is accurate. 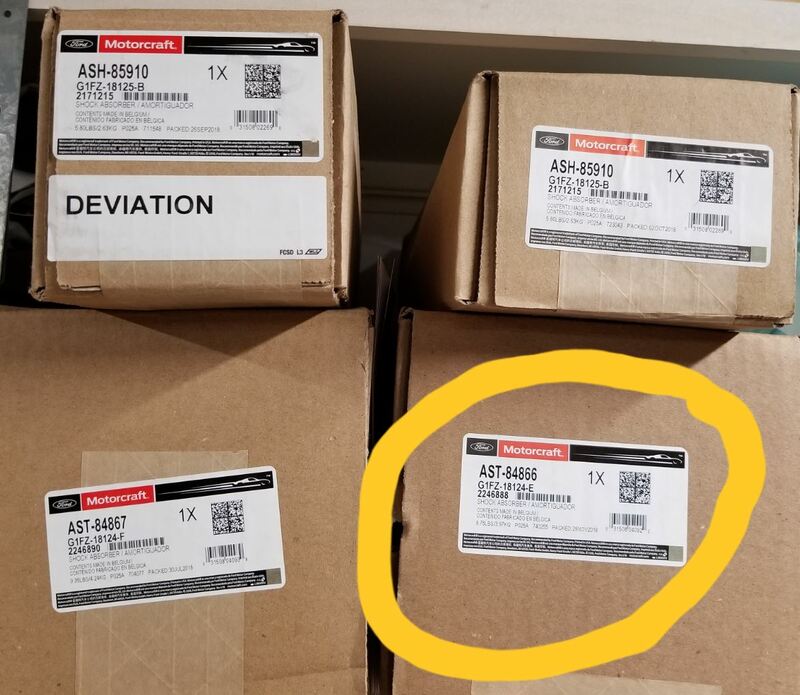 I will be installing them on my ’16 RS2 along with Whiteline Springs, so I won’t be able to provide an apples-to-apples comparison, but thought the Part Number relationships below might be helpful to someone. Anyone know if there’s any difference in the -E Ford OE strut from Tasca/partsgiant and the 84866 motorcraft strut from rock auto other then price?